Last Week on FFO: Two hair-raising dystopias went missing head to obscured head, with Genesis beating Birthmarked by a full head, at least. You felt Birthmarked was too cluttered and busy. I agree, and will add that the colors seemed a bit off. For doom and gloom coloring, Genesis did it better. 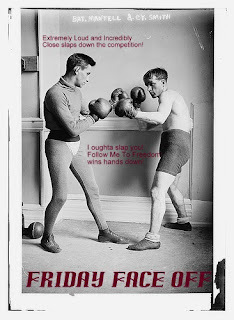 Have something you want to see put to the smackdown on Friday Face Off? Let me know in the comments! The other one is too distracting, the font is boring, and I don't like the colors. The second one. The first is pretty boring and blahh and I dont even feel like trying to read the title. Definitely Extremely Loud. And I don't think that's just because I love little Oskar so much! 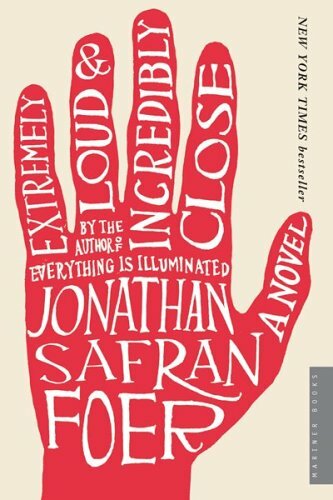 Extremely Loud and Incredibly Close, hands down (hahahahah, get it?). I think this just might be because it is one of my favorites. i vote for extremely loud. although it is not as busy as the other it has better impact. Be My Guest, Robby of Once Upon a Book Blog! Be My Guest, April of Good Books and Good Wine! Be My Guest, Tara of 25 Hour Books! Jane in June is coming -- and you're invited! Be My Guest, Jessica of Jessica's Vision! Oh, and they have shirts!